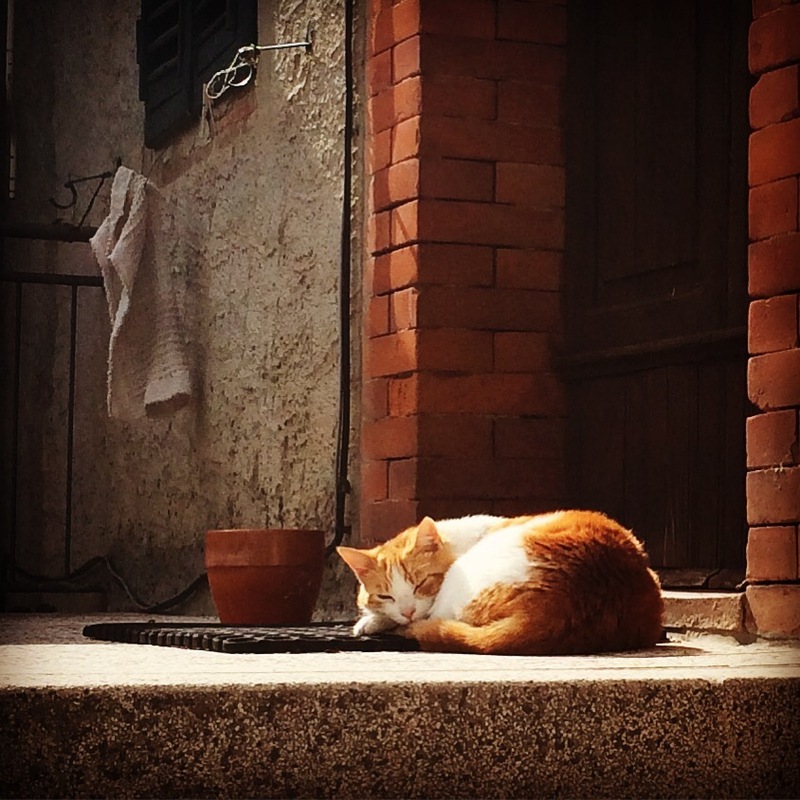 After our soak and steam at the grotto, we venture out to the quiet and quaint hill town of Montecatini Alto. We had traveled up through Montecatini Terme and that looked like somewhere I’d really like to explore – vibrant, bustling – so I am looking forward to wandering the top half. The Alto, it turns out, is much sleepier. But after the gentle morning we’ve had it is perfect. Connecting the upper and lower areas of this town is a funicular train. There won’t be time to ride it today, but just the name makes it sound like fun. 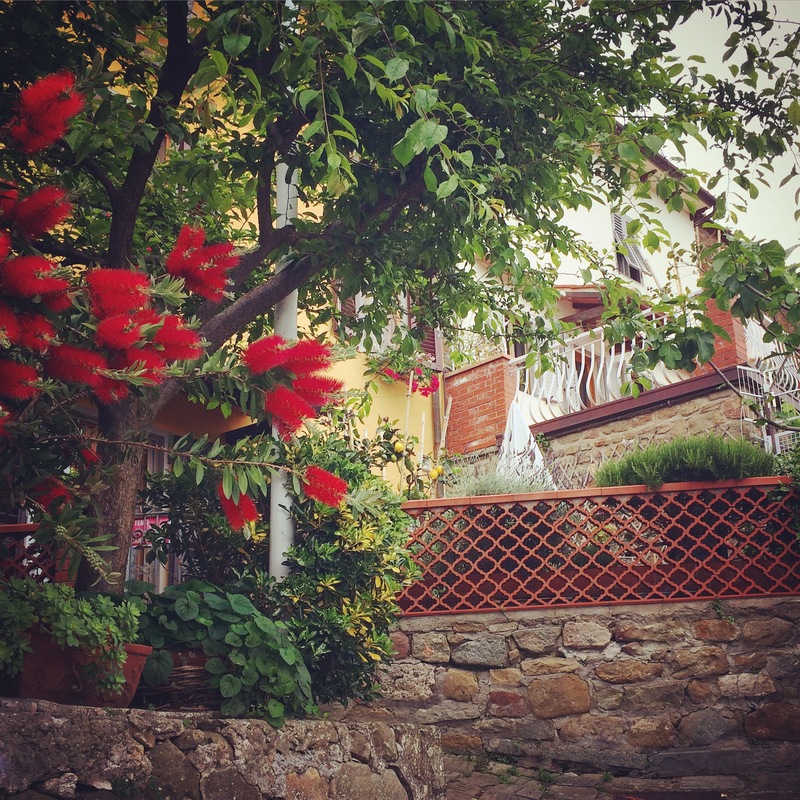 On the main piazza – every hill town has one, and a wall – there are little shops with pottery, lots of it, painted with poppies and lemons and the towering pointy Italian cypress trees, of course. Restaurants abound with outdoor umbrella’d seating that are now mostly empty. And cats. Lots of neighborhood cats. Near the piazza is a road that slopes gently downward, three story old stone buildings on one side, sweeping vistas of Tuscan countryside on the other. Every painting or postcard you’ve ever seen of Tuscany is likely 100% accurate. Once we pry ourselves from this view we head slowly back down the hill toward our car, spying more cats along the way. Near the car a small sunken building with an open door and a cat on its stoop catches our attention. On a table outside are two baskets of freshly picked cherries. They are for sale. A few steps into the dim building reveals bottles of freshly pressed olive oil. Purchases are made. We can hear a rather randy rooster chattering away from somewhere behind the building. Upon further inspection we find him scratching at the dirt among ancient farm equipment. And he’s not alone. His harem is small but devoted. On our way out we make one last stop at the restroom, which happens to be at the finucular train depot. 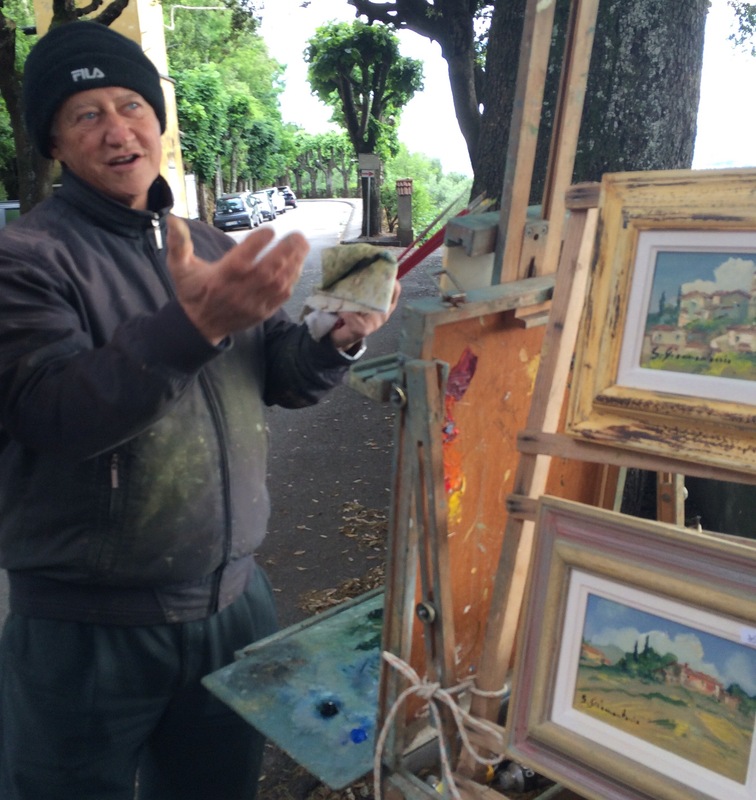 Just outside the station is an older Italian man painting scenes of Montecatini. We strike up a brief conversation, he shares his inspirations for each painting, has us guess at a couple. “Where’s this one?” We look around trying to identify the buildings in the painting. If we can’t find it he tells us. He has so much passion for what he is doing that I can’t help but walk away with a sweet little canvas and a lovely memory.